So here’s what I did to fix it. SVN is part of the Command Line Tools. To install them go to Downloads for Apple Developers. This requires an Apple Developer ID. Getting one is free and only requires an Apple ID which you should all already have. There select Command Line Tools (OS X Mountain Lion) and download the DMG file (it’s about 110 MB). Then open the DMG file, double click on Command Line Tools (Mountain Lion).mpkg, just keep clicking Continue / Agree / Install. An alternative is to install Xcode. You can download it from the Mac App Store. 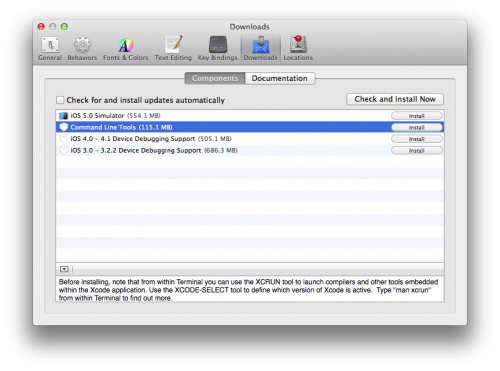 Once Xcode is installed, you can go the Preferences > Downloads > Command Line Tools and install them. Update: Another way is to use Homebrew or MacPorts. Then rerun the subversion install. Universal means it will install both 32 and 64bit version (without this the java bindings will most probably not work fine). And the Java option tells Homebrew to additionally install the Java bindings. drwxrwxr-x  4 root  admin  136 Nov 30 21:36 .
drwxr-xr-x  5 root  wheel  170 Oct 25 22:33 .. If you still have problems when integrating svn with eclipse, please a have look at this post. Note that I’ve written a new post to show how to handle multiple subversion version using brew. Or use homebrew or macports to install svn. Thanks for that, especially the tip about restarting when it hangs on make. I had exactly the same problem. Since I had XCode already installed it was an easy fix following your instruction. Thanks! In case, this line command is invalid, right? PS: The first step, just using Xcode and line command tools does’nt work, thats why i’m just trying with HomeBrew. Note, i’m a designer and i do not have so much experience with line commands lol. You should not write the dollar sign before the command. The one you see in the blog is just the one you have after “imac-de-julio:Downloads julio_graffin17$” in your case. … What can i do? The issue seems to be that the library (libpq.5.dylib) is only available in 64bit on Mountain Lion. There are only 3 solutions, either not to use the native JavaHL library, manage to get a 32 bit library or manage to run it all in 64 bits. Since I don’t have a machine here to test it, I’ll need to check later. I’ll try to resolve with Eclipse. Thank’s a lot for the support! Thank you very much for the post. I did all these steps. but I still have problem. it says “There was a problem while connecting to frost:22”. After installing SVN how should I use it? Thanks a lot of that’s a great help….. Thanks a lot …it was was of much needed help.